Thoughts of Mobile Cloud leadership are top of mind, as software apps become the battle ground of the American smartphone marketplace. And, new mobile enterprise applications are going to be the focus of further research during 2015. Meanwhile, comScore released data from their latest market study, reporting key trends in the U.S. smartphone industry for November 2014. Apple ranked as the top smartphone manufacturer with 41.8 percent OEM market share. Once again, Google Android led as the number one smartphone platform with 52.6 percent platform market share. Facebook ranked as the top individual smartphone app in America. Google has, by far, the most smartphone applications within the top ten ranking positions. 178 million people in the U.S. owned smartphones (73.6 percent mobile market penetration) during the three months ending in November -- that's up by 2 percent since August. Apple ranked as the top OEM with 41.8 percent of U.S. smartphone subscribers. Samsung ranked second with 29.7 percent market share (up 0.8 percentage points from August), followed by LG with 7.6 percent (up 0.9 percentage points), Motorola with 5.2 percent and HTC with 3.7 percent. Android ranked as the top smartphone platform in November with 52.6 percent market share (up 0.6 percentage points from August), followed by Apple with 41.8 percent, Microsoft with 3.4 percent, BlackBerry with 2 percent and Symbian with 0.1 percent. Facebook ranked as the top smartphone app, reaching 69 percent of the app audience, followed by Google Play (52.1 percent), Google Search (51.8 percent) and YouTube (50.8 percent). 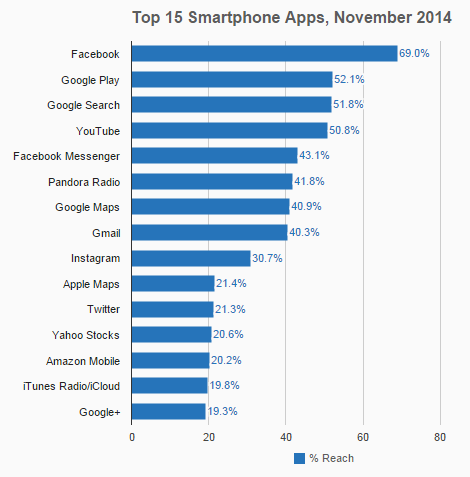 Facebook Messenger ranked in the Top 5 Smartphone Apps for the first time.